Climbing skills - How to set up an abseil? 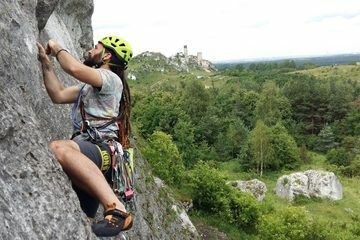 Today in my post I will write about one of the most important climbing techniques. a) make sure that anchor point is unquestionable in terms of safety and attach yourself with sling divide in 2/3 by an overhand knot. b) thread your rope throughout anchor master point and find a middle of the rope. c) tie knots in the end of each strand (stopper knot), throw a coiled rope down. d) attach prusik knot (French prusik) to your harness belay loop and wrap the strands around your abseil rope, clip back to belay loop. e) pull the rope up and slide the prusik down to check if prusik holds the rope. f) attach your belay device to a bottom part of the sling paying attention to the correct orientation of it and put both ropes into the belay device. g) bring the belay device and prusik up closer to the master point, make sure that prusik does not touch belay device. h) check all screw gate crabs if locked, check if all is attached correctly, hold the ropes by one hand between prusik and belay device, unclip yourself from a master point using one hand. 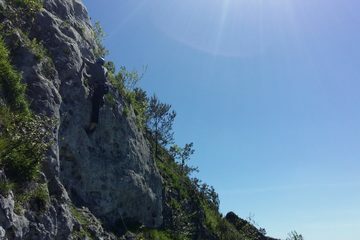 Book onto my climbing course to learn all the skills under excellent and professional supervision.